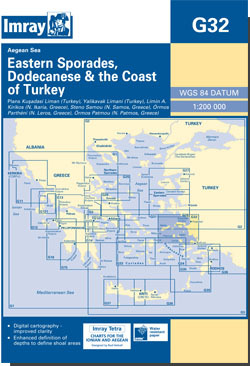 The southern Sporades islands and the adjacent coast of Turkey. Scale: 1 : 189.700. Larger scale plans of Kusadasi Liman (Turkey) , Limin Karlovasi (Samos), Limin Aghiou Kirikou (Ikaria), Steno Samou (Samos), Limin Pithagoriou (Samos), Ormos Patmou (Patmos). For this 2014 edition the chart has been fully updated throughout and the latest known depths applied. Harbour developments are shown at Kusadasi. The plan of Áyros Kírikos has been replaced with a brand new plan of Póros Foúron, designed to show passage through Nisídhes Foúrnoi.